Hypospadiology is a surgical textbook which covers every aspect of hypospadias repair. 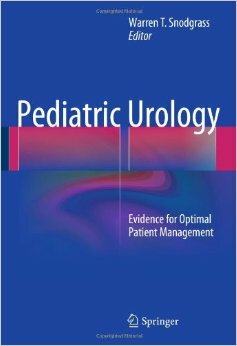 Written by authors (Snodgrass and Bush) with extensive experience in primary and reoperative hypospadias surgery, it is a step-by-step photographic atlas of the most commonly used techniques, and reviews everything from preoperative evaluation, risk factors for complications, unusual variants, and pitfalls in hypospadias repair. All proceeds from this book go to our non-profit charity, Operation Happenis, whose goals are increasing public awareness of hypospadias, helping patients with proximal hypospadias or failed repairs, and funding postgraduate surgical education. Click for more info. Hypospadiology summarizes the best evidence for preoperative, intraoperative, and postoperative assessment and management of hypospadias. It presents modern surgical algorithms for both primary and reparative repairs, and then describes in detail – with diagrams and color photographs – today’s commonly used techniques. Emphasis is given to key technical steps to help surgeons avoid complications. The textbook is designed for both trainees and experienced hypospadias surgeons of all specialties. Among the unique chapters in this hypospadias textbook are Pitfalls in Distal Repair, Flaps versus Grafts, Adult Outcomes after Childhood Repair, Hypospadias Repair in Adults, and Teaching Hypospadias Surgery. The colorful history of hypospadiology is woven throughout to give readers a greater understanding of how the subspecialty evolved. 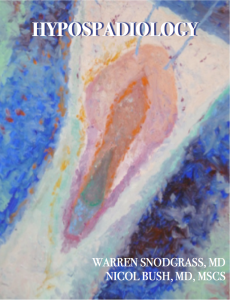 Dr. Snodgrass and Dr. Bush wish to thank Dr. Pierre Mouriquand for providing his original work of art for the cover. We also thank Dr. Anthony Caldamone for his assistance throughout this project and his service on the Board of Directors of Operation Happenis, and Mrs. Whitney Wells Lewis for her tireless help formatting and copy editing the book.